Empires of History: WWII is a territorial strategy game covering the second world war. A variant of the Axis & Allies board game system, and a flagship game in the Empires of History game series, it offers an easy to play D10 based combat system and territories with resource values for production. More than 7 years in the making, it stands as king atop the Empires of History line of historical strategy games. Two full color game maps present Europe, North Africa, the Middle East, Asia and the Pacific in detail. Movement between the maps is clearly defined and a comprehensive series of off map boxes contain North America, South America, the Atlantic central and lower Africa and more. One game: the entire war. With Manpower Limits, detailed technology development rules, and accurate historical detailing, Empires of History: WWII provides all of the game play quality and historical detail that gamers have come to expect from the Empires of History board game series. With over 1700 counters, 11 nation sheets and 3 political options booklets, players assume the mantle of command of the Axis & Allied forces with an option for the US player to play with their own agenda. 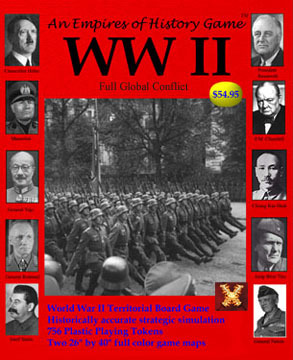 The game comes with a standard 1939 start for the war, but with the available political options, the game can either follow the path of the war or diverge from it fairly substantially. Limited resources like Oil Resources, Manpower Limits and difficult to defend naval sea trade resources, neither side has it easy and both should experience the desperate need for very limited resources. The link below is the original PDF for the game rules. Edits to the print edition may have occurred since posting this. This is the main rules booklet and does not contain the assorted political options for the various nations contained in the political option booklets.